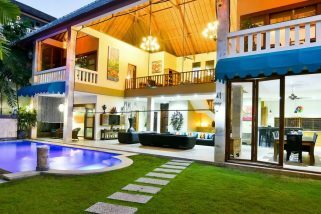 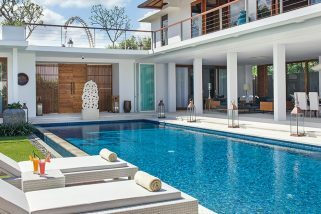 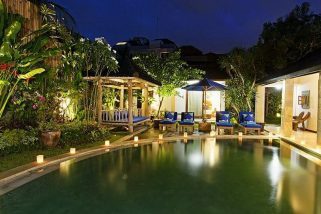 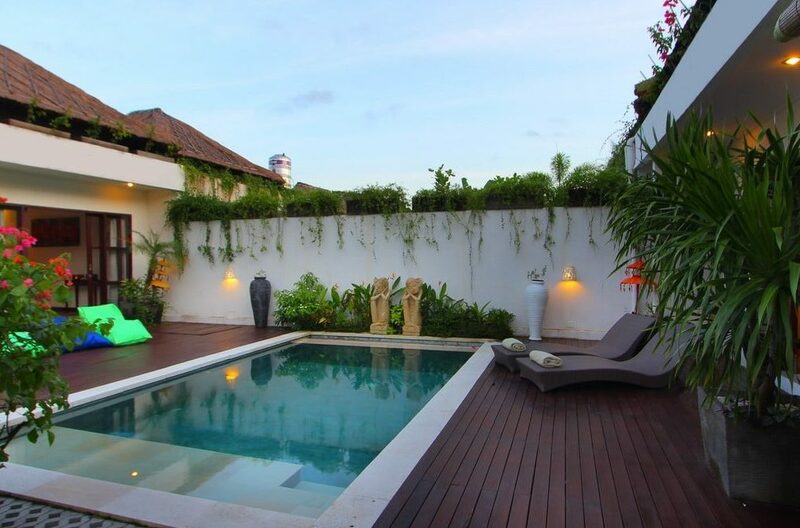 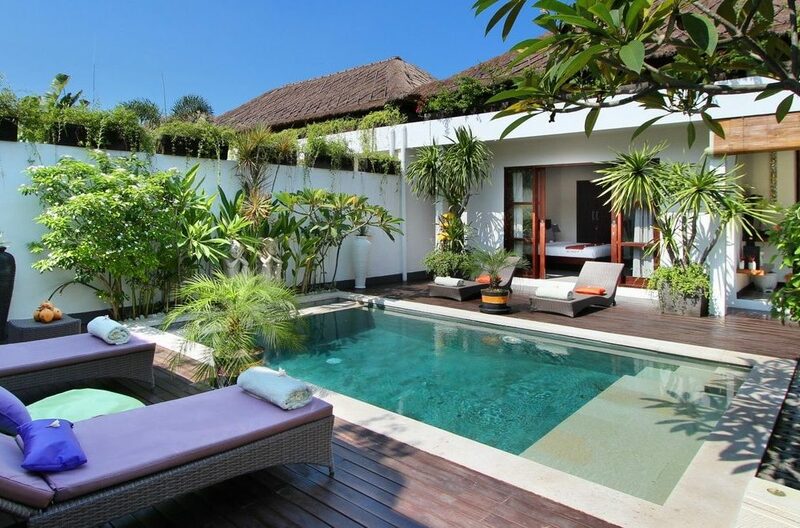 The villa is entered through a lush tropical garden complete with wooden decking and a luxurious swimming pool. 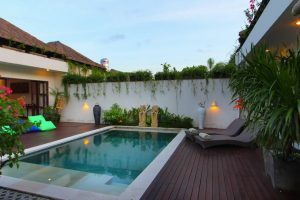 Whether you are reclining on the loungers reading a book or taking a refreshing dip, this is a great place to hang out with your loved ones where you will fully appreciate the temperate climes of this paradise. 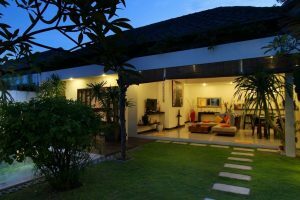 The accommodation is spread between two buildings which face each other across the garden. 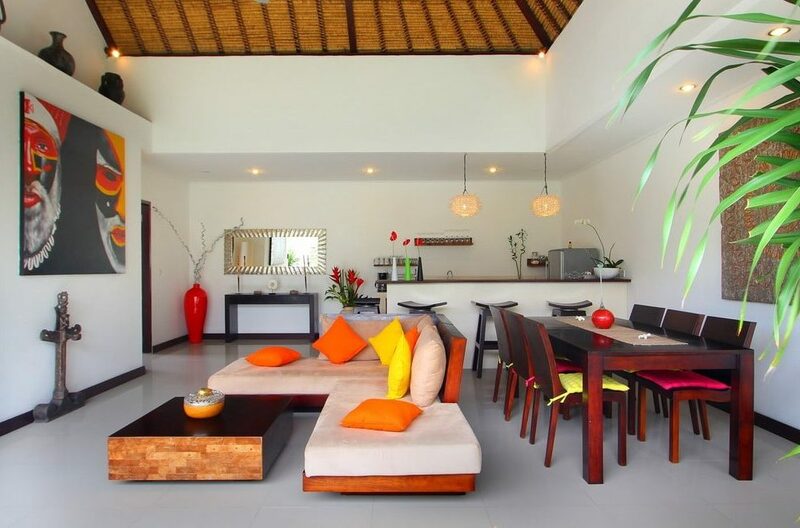 The larger building contains the living accommodation which is topped by a fabulous, traditionally thatched roof. This design makes the most of the natural sea breezes in the space which is open to the elements on one side. At the fore, is a chic comfortable seating area with a large TV, perfect for a movie night and a 6 seater dining table which is ideal for long lazy breakfasts. 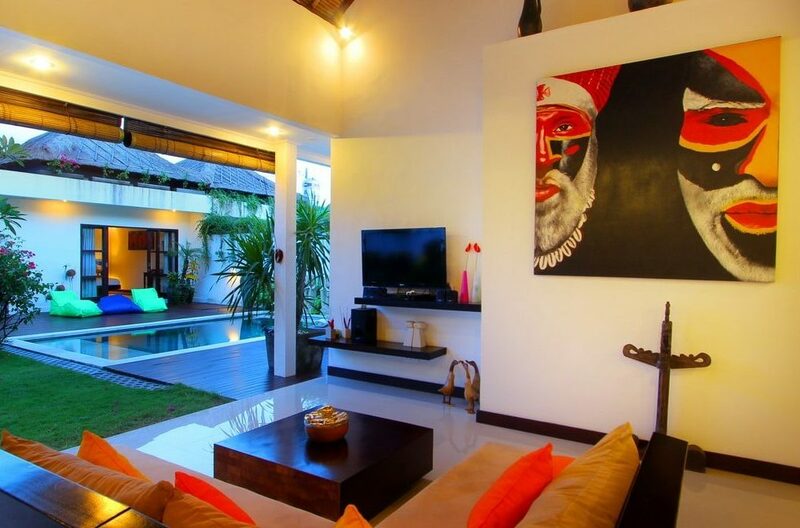 These both have a great view of the swimming pool. 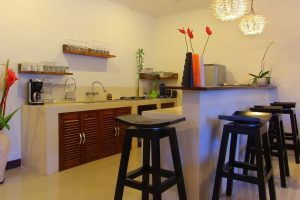 To the rear, is a state of the art kitchen complete with modern conveniences. 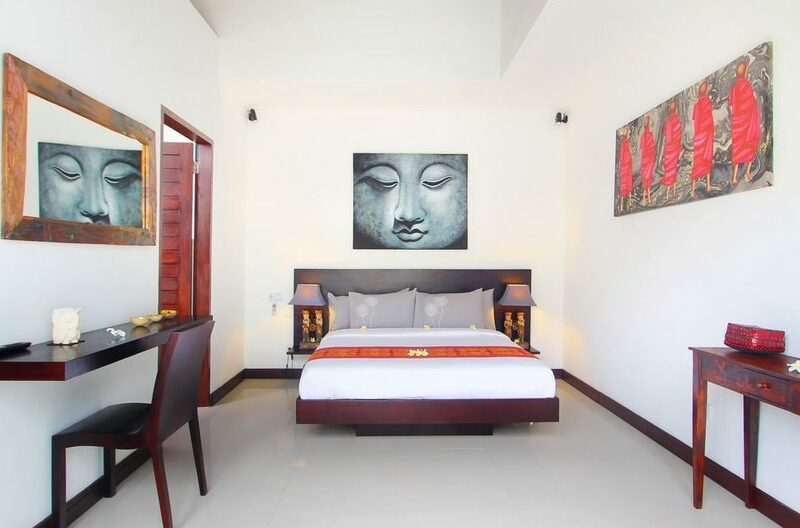 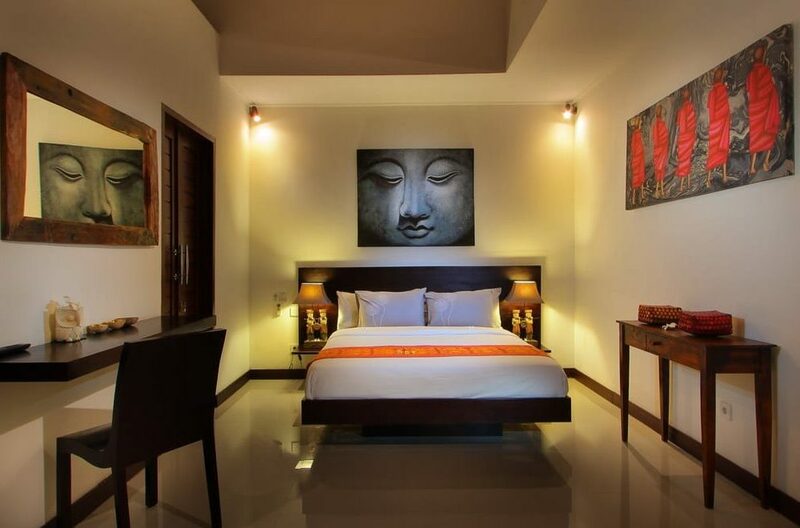 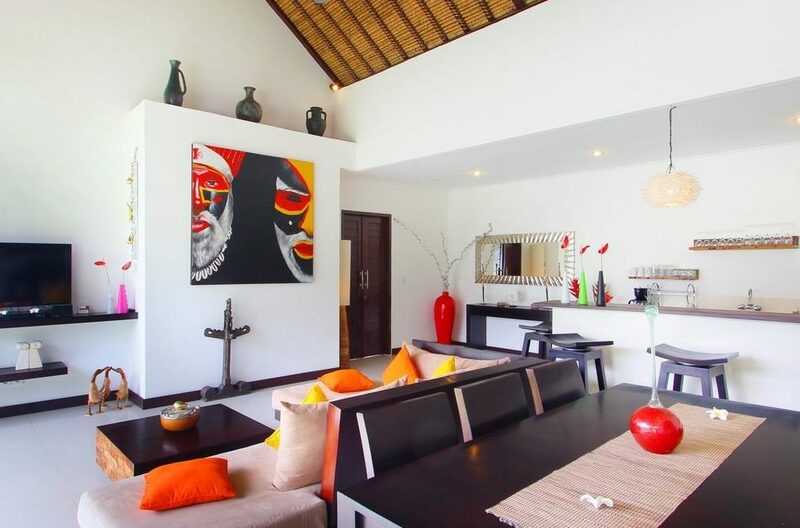 The area is immaculately white washed with tastefully contrasting dark, natural wood furniture and beautifully chosen pieces of contemporary Balinese art. 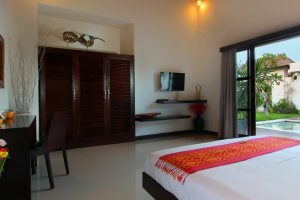 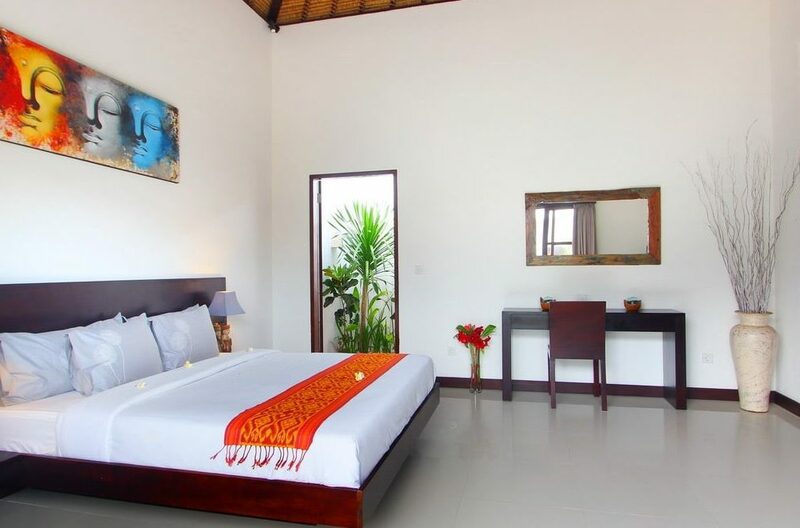 Also contained in this main building is double bedroom with a TV, air conditioning and its own ensuite bathroom. 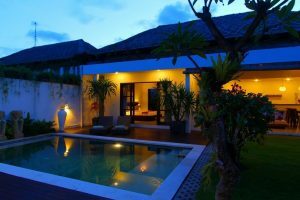 This can be reached by patio doors from the garden area and is enchantingly capped by the high slanting roof of thatch and generously sized. 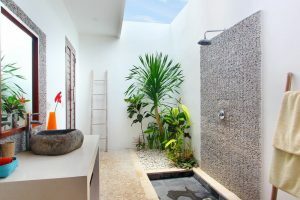 This room is a great place to escape this heat of the day. 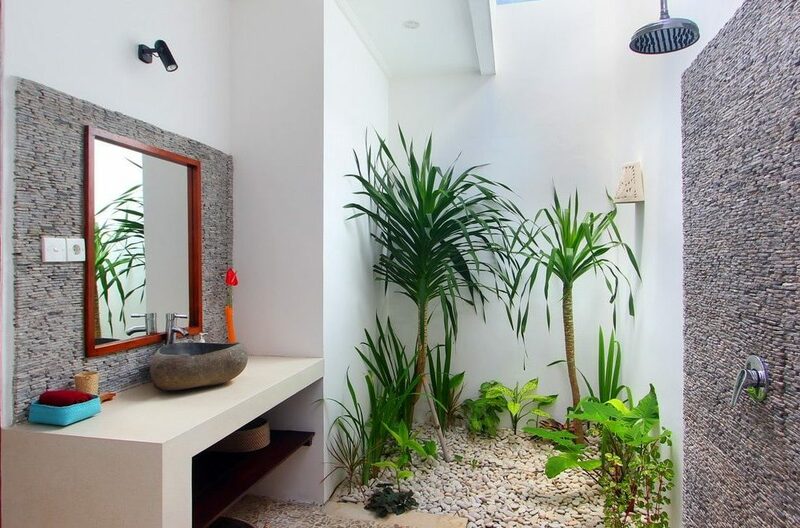 The bathroom is elegant and well furnished with its own private tropical pod of greenery. 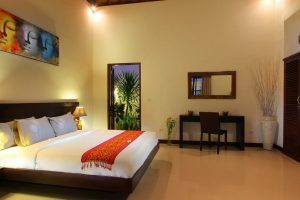 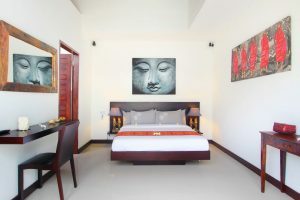 The smaller building houses another spacious double bedroom with ensuite bathroom and includes the same amenities as the room in the main building. 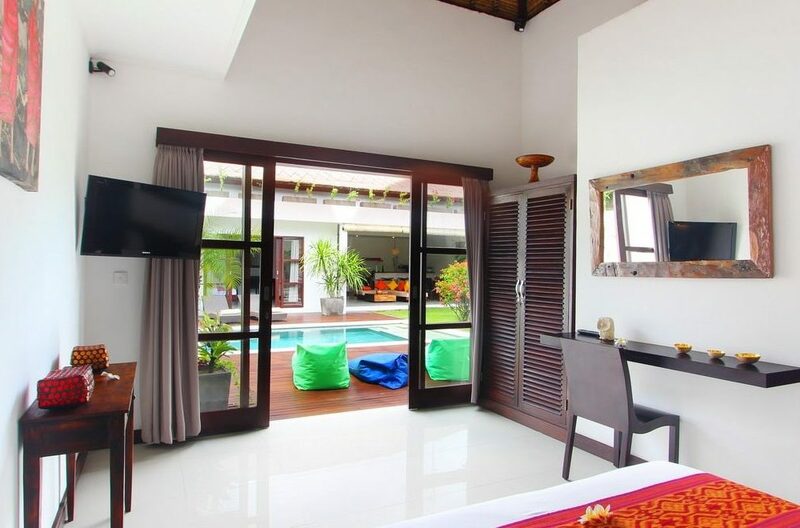 It’s also reached via a garden door but this room has its own decked terrace with bean bags giving you yet another chill out space with garden views. 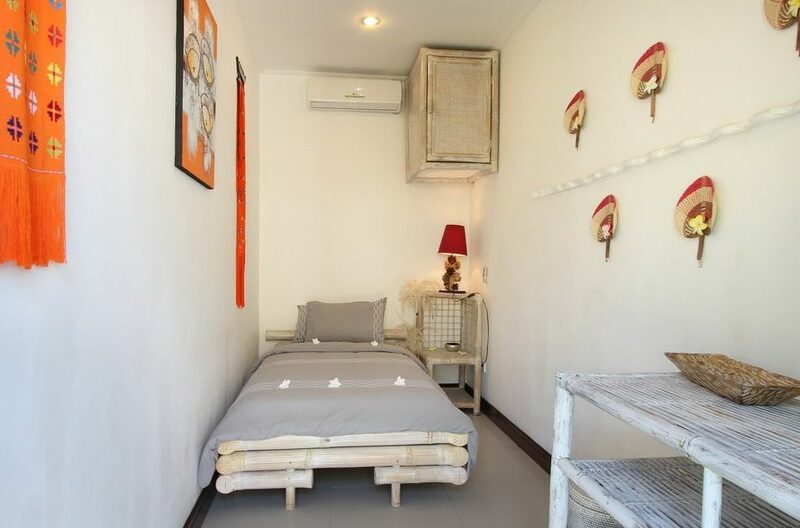 In addition, contained in this block, is an air conditioned kids bedroom. 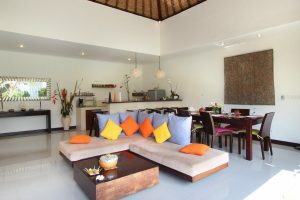 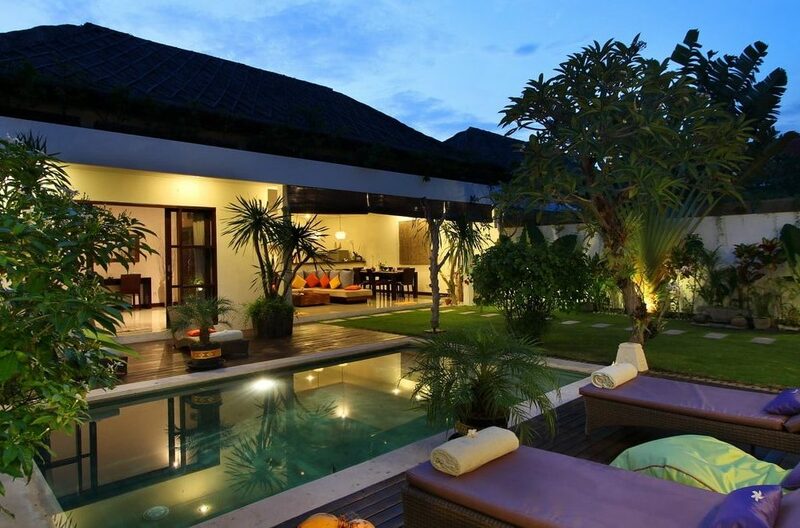 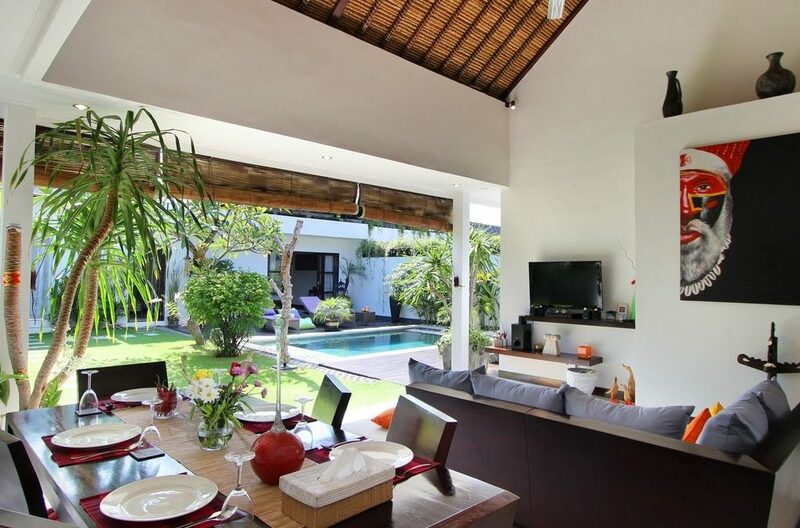 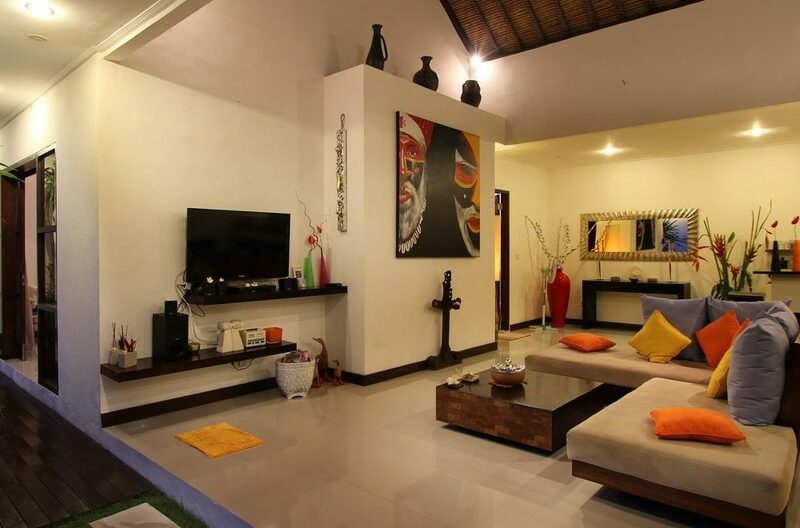 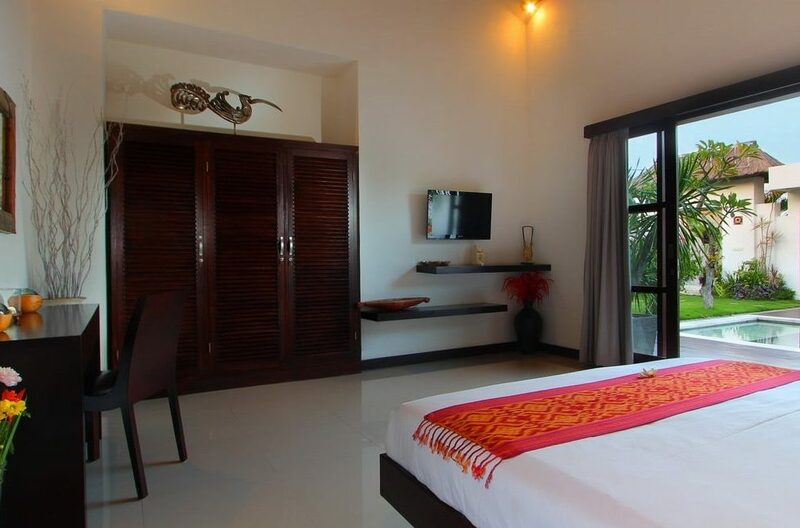 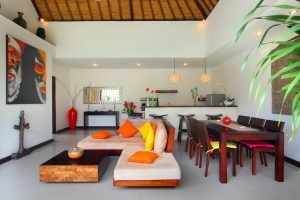 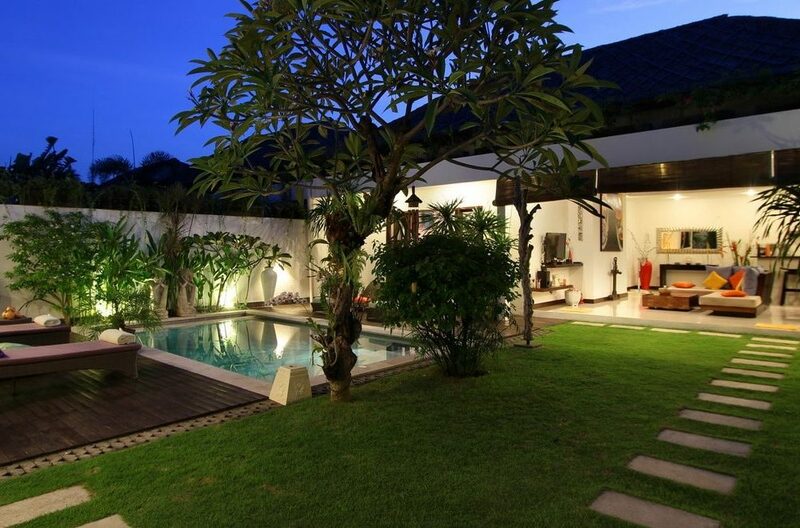 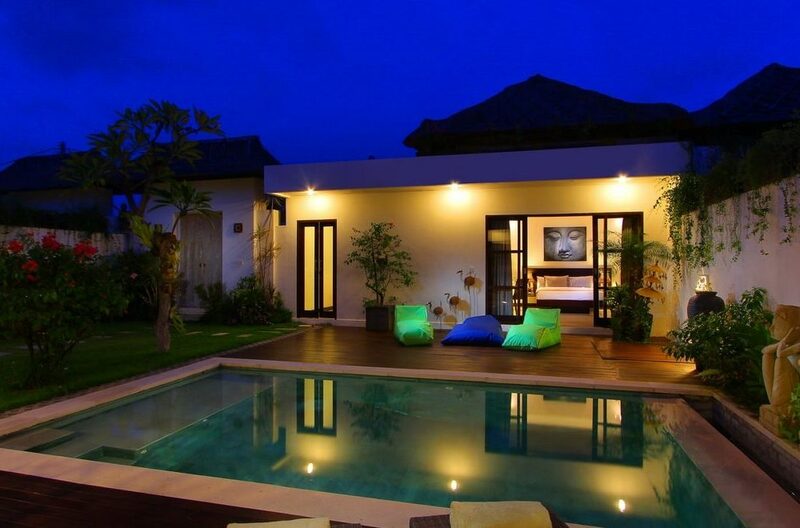 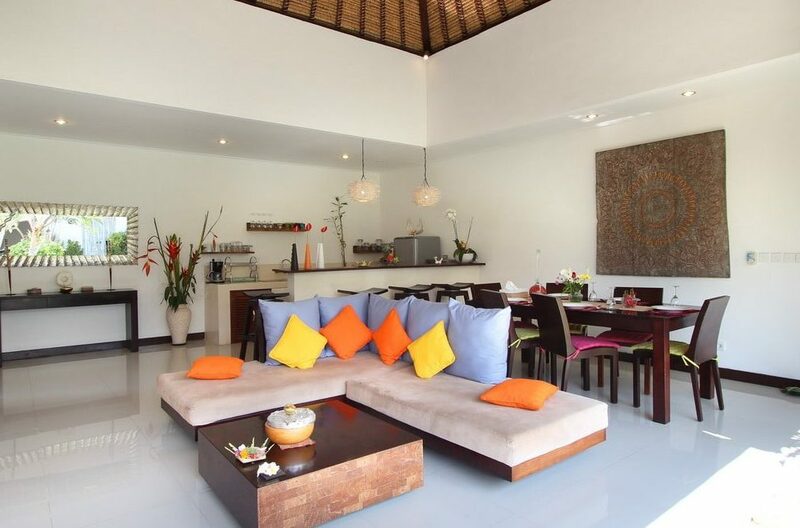 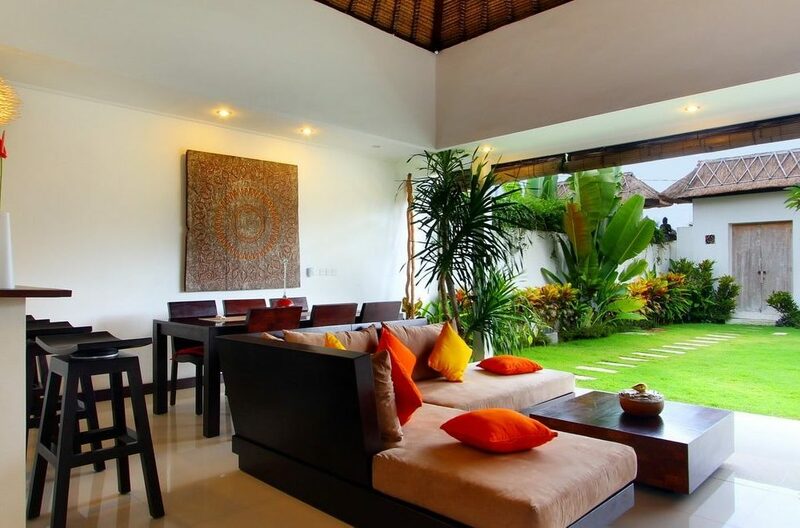 This stunning villa comes with a half day maid service and night time security. 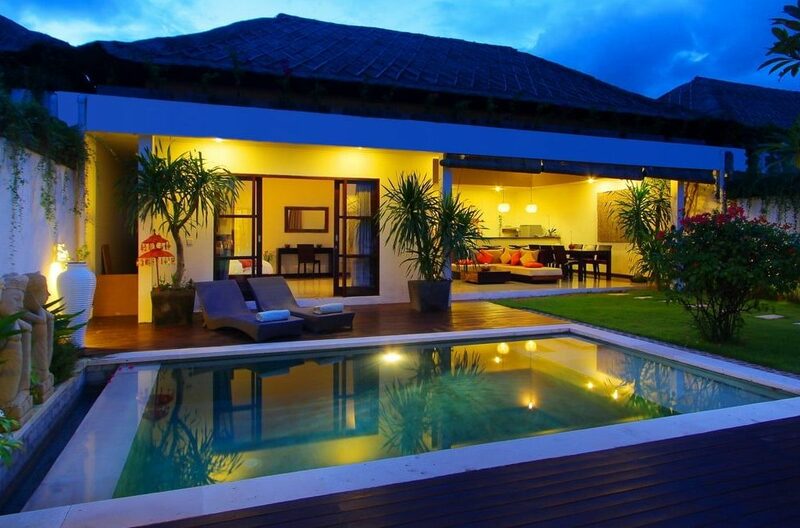 Furthermore a mobile phone with a local number is provided for your convenience. BatuBelig is a great area to base your Bali adventure because of its proximity to the beach which is quieter than some of the others along this coast. 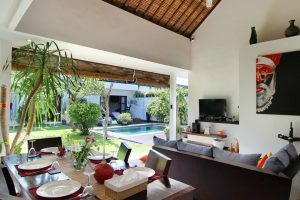 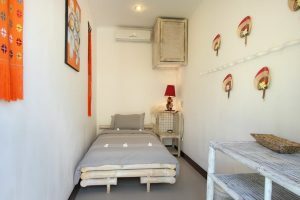 It is also sandwiched between Canggu and Seminyak which both provide some excellent eateries, notorious hang outs and some great shopping options.